Hello everyone…I’m Cheri, an interior stylist who has an all consuming passion for fashion and home decor. I’m vegetarian and try to eat as clean and holistically as possible. I was born on Halloween, which I attribute to my feisty nature. Married to the love of my life and high school sweetheart Justin, he loves design and home decor just as much as I do. He is my own little personal handyman… and a very talented handyman I might add. I can’t take credit for all the designs on this blog; while a lot of them might be my ideas or a meshing of the two of ours, he is the execution behind the project. We’re a perfect match. Oh, and did I mention we have two weimaraners? True life: I’m obsessed with my dogs. Justin and I own a home and fashion accent boutique in Kernersville, NC where we were born and raised, and couldn’t be happier. My father was a gemologist and owned a jewelry store when I was growing up, so I always had a strong belief that I would own my own boutique one day. Here we are! 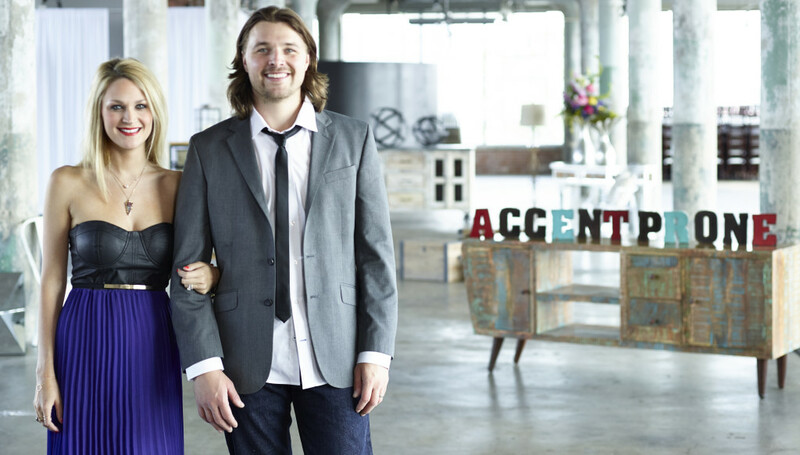 Justin’s family is in the furniture industry and he grew up in the wholesale side of the business working with his parents, so Accent Prone is literally a meshing of our two backgrounds; home and fashion. SO, what is Accent Prone? We’ve formulated our own definition. Adjective: A Strong, Innate desire of representing a current Popular Trend or Style with Fashionable Accents. Synonyms: fashionable, modern, up to date, stylish, chic, trendy, attention to detail. Don’t be boring. Be Accent Prone. From head to toe, wall to wall, we live life by that definition. Follow along with us on the blog as we show you how to live life more Accent Prone for yourselves! Just recently, Justin and I were blessed to be able to buy our very first home, so we will be decorating each room from start to finish and showing you the whole process. There will be tutorials, easy DIY projects, before and afters of our home, and my love of everyday fashion and accessorizing will be posted along the way. 2-I haven’t drank a soda or (GASP!) SWEET TEA in over a year. Being a southern belle, this is an accomplishment. 3-I LOVE Rachel Zoe. She is my style icon. period. 4-I am embarrassingly still of fan of Britney. Oops, I just can’t help myself. 5- “Rustic Chic” is my personal decorating style. I love organic woods and furnishings mixed with surprisingly contemporary variations. As with everything in life, balance is key. 6- While in college I was mentored by the former president of HGTV and received influential guidance from her to embark on my journey with Accent Prone. 7- Lipstick is my thing. 8- I was the kid in second grade who bought a rad bell bottom jumpsuit and coordinating lime green pleather jacket to wear to school picture day. I might have looked ridiculous, but I rocked it regardless. I’ve always had a sense of personal style. 9-I was also that kid that rearranged their room despite their parents warnings. I was making cut and paste collage boards like a pro before pinterest existed. 10-I believe God is. Without that constant in my life, I would be insane. Hope that gives you a little background to the face behind ‘My Accent Prone Life’! Thanks for listening to me ramble on! Looking forward to getting to know all of you!